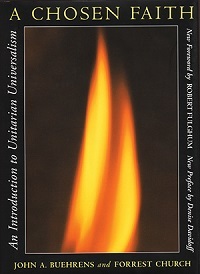 This is the classic introductory text on Unitarian Universalism with chapters by former UUA President John Beuhrens and Forrest Church that explore the many sources of the living faith tradition of their chosen faith. This is a thought-provoking, entertaining sourcebook for searchers, newcomers and lifelong learners. Preface by former UU moderator Denise Davidoff. Important to remember: Although the authors of this book are judgmental of and insulting to atheists, UU congregations are not, as a rule, and often welcome atheists. Don't be scared off UU based on this "introduction."